About Me | More blue fabric? 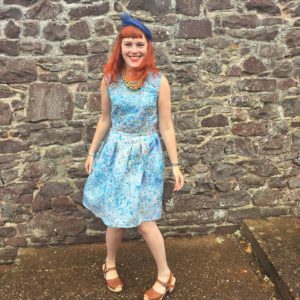 I live in a small house in Birmingham, and this blog is the place where I keep track of the things that I sew (which, I confess, like the dress in the picture, are usually blue). You can take a look at things I’ve made so far by clicking on “Things I’ve Made”, or see what takes your fancy from the categories on the right hand side, where, as well as my finished items, you can read about some of the other sewing things that I have going on. I try to post at least once a week, so I’ll hope you’ll join me on my journey, if only to see the silly poses I end up pulling in the majority of photos!